"With strong family values at our core that date back to our humble beginnings, we share one common commitment towards Quality and Patient health"
Led by a group of individuals coming from diverse backgrounds and experiences, our leadership team is tasked with guiding CorePharma into the future. Please read the following carefully to understand our use of your Data. You have the right to object to us processing your Data on the basis of our legitimate interests. You are not obliged to provide us with your Data, but failure to provide us with your contact details may result in us being unable to respond to any questions or requests you submit to us via our website. In pursuing these legitimate interests, we will respect your right to protection of your Data, and will make no attempt to identify you, or to associate the technical details we collect from your visit, unless required to do so by law. We will store your Data only for as long as necessary for the purposes of providing access to our Site and related services to you; as required by law, and for the exercise or defense of legal claims. We may disclose your Data to third parties who provide a service to us, including our Internet Service Provider who records data on our behalf and is bound by confidentiality provisions, or in the event that we sell or buy any business or assets, in which case we may disclose your Data to the prospective seller or buyer of such business or assets or if we are under a duty to disclose or share your Data in order to comply with any legal obligation, or where necessary for our legitimate business interests to protect the rights, property, or safety of CorePharma LLC., our customers, or others. This includes exchanging information with other companies and organizations for the purposes of fraud protection and credit risk reduction. The transmission of information via the Internet is not completely secure and may involve the transfer of Data to a third party outside of the USA. To the limited extent that it is necessary to transfer your Data outside of the USA, we will ensure appropriate safeguards are in place to protect the privacy and integrity of such Data. The right to erasure enables you to ask us to delete your Data in certain circumstances, for example where it is no longer necessary for us to process it or if you consider it is being unlawfully processed. Your request can be refused if the processing is necessary to comply with a USA legal obligation or for the exercise or defense of legal claims. The right to object enables you to object to your Data being processed on the basis of our legitimate interests (or those of a third party). We will stop such processing unless there are compelling legitimate grounds for the processing or the processing is necessary for the exercise or defense of legal claims. You also have the right to object to us processing your Data for direct marketing purposes. Any requests to exercise your rights should be addressed to info@corepharma.com. We will respond to your request in writing, including by electronic means, or orally if requested, within one month of receipt of your request. We may request proof of identification to verify your request. We have the right to refuse your request if it is manifestly unfounded or excessive, or to the extent necessary for important objectives of general public interest. We are committed to protecting the security of your Data. We use a variety of security technologies and procedures to help protect your Data from unauthorized access and use. As effective as modern security practices are, no physical or electronic security system is entirely secure. We cannot guarantee the complete security of our database, nor can we guarantee that information you supply will not be intercepted while being transmitted to us over the Internet. We have implemented strict internal guidelines to ensure that your privacy is safeguarded at every level of our organization. We will continue to revise policies and implement additional security features as new technologies become available. Questions, comments, requests and complaints regarding this Privacy Statement and the Data we hold are welcome and should be addressed to info@corepharma.com or sent in writing to 215 Wood Ave, Middlesex NJ 08846. All requests will be dealt with promptly and efficiently. CorePharma may permanently or temporarily terminate, suspend, or otherwise refuse to permit your access to the Website without notice and liability for any reason, including if in our sole determination you violate any provision of this Agreement, or for no reason. Upon termination for any reason or no reason, you continue to be bound by this Agreement. All aspects of the Website are subject to change or elimination at the sole discretion of CorePharma. CorePharma reserves the right to interrupt access to or operation of the Website with or without prior notice for any reason or no reason. You agree that CorePharma will not be liable to you for any interruption of access to or operation of the Website, delay or failure to perform. This Website contains forward-looking statements involving risks and uncertainties, including expectations regarding financial goals, current products and product development efforts. The actual results of CorePharma may differ materially from those in the forward-looking statements. Our Proprietary Rights CorePharma authorizes you to copy documents or pages published by us on this Website for your non-commercial reference use only, provided any copy you make retains all copyright or other proprietary notices and any disclaimers contained herein. If you link to any other websites from this site, you should follow the copyright provisions contained in those sites. The Website and all materials therein or transferred thereby, including, without limitation, software, images, text, graphics, illustrations, logos, patents, trademarks, service marks, copyrights, photographs, audio, and videos (the "CorePharma Content"), and all Intellectual Property Rights (as defined below) related thereto, are the exclusive property of Company and its licensors. For the purposes of this Agreement, "Intellectual Property Rights" means all patent rights, copyright rights, mask work rights, moral rights, rights of publicity, trademark, trade dress and service mark rights, goodwill, trade secret rights and other intellectual property rights as may now exist or hereafter come into existence, and all applications therefore and registrations, renewals and extensions thereof, under the laws of any state, country, territory or other jurisdiction. All product names that appear on the Website, regardless of whether or not they appear in large print or with a trademark symbol, are trademarks of CorePharma, its licensees, or other third parties. Except as explicitly provided herein, nothing in this Agreement shall be deemed to create a license in or under any Intellectual Property Rights in the CorePharma Content, and you agree not to sell, license, rent, modify, distribute, copy, reproduce, transmit, publicly display, publicly perform, publish, adapt, edit or create derivative works from any materials or content accessible on the Website, or use such materials or content for any purpose not expressly permitted by this Agreement. CorePharma, CorePharma, LLC., and symbols related thereto are trademarks of CorePharma, LLC. All other marks used herein are the property of the owner thereof. Any communication you transmit to CorePharma via this Website or internet electronic mail is transmitted by you on a non-confidential basis. CorePharma makes no promise, express or implied, not to use such communication or material for any purpose whatsoever, including reproduction, publication, broadcast and posting. You agree that your disclosure is gratuitous, unsolicited and without restriction and will not place CorePharma under any fiduciary or other obligation, and that we are free to use the communication without any additional compensation to you. You further acknowledge that, by acceptance of your communication, CorePharma does not waive any rights to use similar or related ideas previously known to CorePharma, or developed by its employees, or obtained from sources other than you. Security CorePharma has implemented commercially reasonable technical and organizational measures designed to secure information and communications from accidental loss and from unauthorized access, use, alteration or disclosure. However, we cannot guarantee that unauthorized third parties will never be able to defeat those measures or use information or communications for improper purposes. You acknowledge that you provide any information or communications at your own risk. Third-Party Links Certain links on this Website lead to resources maintained by third parties over which CorePharma has no control. As such, CorePharma does not adopt, endorse, opine or make any representation as to the truth, accuracy, legality or any other aspect of the information contained in those resources. Indemnity - You agree to defend, indemnify and hold harmless CorePharma and its subsidiaries, agents, licensors, managers, and other affiliated companies, and their employees, contractors, agents, officers and directors, from and against any and all claims, damages, obligations, losses, liabilities, costs or debt, and expenses (including but not limited to attorney’s fees) arising from: (i) your use of and access to the Website, including any data or content transmitted or received by you; (ii) your violation of any term of this Agreement, including without limitation your breach of any of the representations and warranties herein; (iii) your violation of any third-party right, including without limitation any right of privacy, publicity rights or Intellectual Property Rights; or (iv) your violation of any law, rule or regulation of the United States or any other country. No Warranty THE WEBSITE IS PROVIDED ON AN "AS IS" AND “AS AVAILABLE” BASIS. USE OF THE WEBSITE IS AT YOUR OWN RISK. TO THE MAXIMUM EXTENT PERMITTED BY APPLICABLE LAW, THE WEBSITE IS PROVIDED WITHOUT WARRANTIES OF ANY KIND, WHETHER EXPRESS OR IMPLIED, INCLUDING, BUT NOT LIMITED TO, IMPLIED WARRANTIES OF MERCHANTABILITY, FITNESS FOR A PARTICULAR PURPOSE, OR NON-INFRINGEMENT. NO ADVICE OR INFORMATION, WHETHER ORAL OR WRITTEN, OBTAINED BY YOU FROM COREPHARMAOR THROUGH THE WEBSITE WILL CREATE ANY WARRANTY NOT EXPRESSLY STATED HEREIN. WITHOUT LIMITING THE FOREGOING, COREPHARMA, ITS SUBSIDIARIES, AND ITS LICENSORS DO NOT WARRANT THAT THE CONTENT IS ACCURATE, RELIABLE OR CORRECT; THAT THE WEBSITE WILL MEET YOUR REQUIREMENTS; THAT THE WEBSITE WILL BE AVAILABLE AT ANY PARTICULAR TIME OR LOCATION, UNINTERRUPTED OR SECURE; THAT ANY DEFECTS OR ERRORS WILL BE CORRECTED; OR THAT THE WEBSITE IS FREE OF VIRUSES OR OTHER HARMFUL COMPONENTS. ANY CONTENT DOWNLOADED OR OTHERWISE OBTAINED THROUGH THE USE OF THE WEBSITE IS DOWNLOADED AT YOUR OWN RISK AND YOU WILL BE SOLELY RESPONSIBLE FOR ANY DAMAGE TO YOUR COMPUTER SYSTEM OR LOSS OF DATA THAT RESULTS FROM SUCH DOWNLOAD. COREPHARMA DOES NOT WARRANT, ENDORSE, GUARANTEE, OR ASSUME RESPONSIBILITY FOR ANY PRODUCT OR SERVICE ADVERTISED OR OFFERED BY A THIRD PARTY THROUGH THE WEBSITE OR ANY HYPERLINKED WEBSITE OR SERVICE, OR FEATURED IN ANY BANNER OR OTHER ADVERTISING, AND COREPHARMA WILL NOT BE A PARTY TO OR IN ANY WAY MONITOR ANY TRANSACTION BETWEEN YOU AND THIRD-PARTY PROVIDERS OF PRODUCTS OR SERVICES. Limitation of Liability - TO THE MAXIMUM EXTENT PERMITTED BY APPLICABLE LAW, IN NO EVENT SHALL COREPHARMA, ITS AFFILIATES, AGENTS, DIRECTORS, EMPLOYEES, SUPPLIERS OR ITS LICENSORS BE LIABLE FOR ANY DIRECT, INDIRECT, PUNITIVE, INCIDENTAL, SPECIAL, CONSEQUENTIAL OR EXEMPLARY DAMAGES, INCLUDING WITHOUT LIMITATION DAMAGES FOR LOSS OF PROFITS, GOODWILL, USE, DATA OR OTHER INTANGIBLE LOSSES, THAT RESULT FROM THE USE OF, OR INABILITY TO USE, THE WEBSITE. UNDER NO CIRCUMSTANCES WILL COREPHARMABE RESPONSIBLE FOR ANY DAMAGE, LOSS OR INJURY RESULTING FROM HACKING, TAMPERING OR OTHER UNAUTHORIZED ACCESS OR USE OF THE WEBSITE OR THE INFORMATION CONTAINED THEREIN. TO THE MAXIMUM EXTENT PERMITTED BY APPLICABLE LAW, COREPHARMA ASSUMES NO LIABILITY OR RESPONSIBILITY FOR ANY (I) ERRORS, MISTAKES, OR INACCURACIES OF CONTENT; (II) PERSONAL INJURY OR PROPERTY DAMAGE, OF ANY NATURE WHATSOEVER, RESULTING FROM YOUR ACCESS TO OR USE OF THE WEBSITE; (III) ANY UNAUTHORIZED ACCESS TO OR USE OF OUR SECURE SERVERS AND/OR ANY AND ALL PERSONAL INFORMATION STORED THEREIN; (IV) ANY INTERRUPTION OR CESSATION OF TRANSMISSION TO OR FROM THE WEBSITE; (V) ANY BUGS, VIRUSES, TROJAN HORSES, OR THE LIKE THAT MAY BE TRANSMITTED TO OR THROUGH THE WEBSITE BY ANY THIRD PARTY; (VI) ANY ERRORS OR OMISSIONS IN ANY CONTENT OR FOR ANY LOSS OR DAMAGE INCURRED AS A RESULT OF THE USE OF ANY CONTENT POSTED, EMAILED, TRANSMITTED, OR OTHERWISE MADE AVAILABLE THROUGH OR FROM THE WEBSITE; AND/OR (VII) THE DEFAMATORY, OFFENSIVE, OR ILLEGAL CONDUCT OF ANY THIRD PARTY. IN NO EVENT SHALL COREPHARMA, ITS AFFILIATES, AGENTS, DIRECTORS, EMPLOYEES, SUPPLIERS, OR LICENSORS BE LIABLE TO YOU FOR ANY CLAIMS, PROCEEDINGS, LIABILITIES, OBLIGATIONS, DAMAGES, LOSSES OR COSTS IN AN AMOUNT EXCEEDING THE AMOUNT YOU PAID TO COREPHARMA HERE UNDER. THIS LIMITATION OF LIABILITY SECTION APPLIES WHETHER THE ALLEGED LIABILITY IS BASED ON CONTRACT, TORT, NEGLIGENCE, STRICT LIABILITY, OR ANY OTHER BASIS, EVEN IF COREPHARMAHAS BEEN ADVISED OF THE POSSIBILITY OF SUCH DAMAGE. THE FOREGOING LIMITATION OF LIABILITY SHALL APPLY TO THE FULLEST EXTENT PERMITTED BY LAW IN THE APPLICABLE JURISDICTION. CorePharma makes no representations that the Website is appropriate or available for use in other locations. Those who access or use the Website from other jurisdictions do so at their own volition and are entirely responsible for compliance with all applicable United States and local laws and regulations, including but not limited to export and import regulations. You may not use the Website if you are a resident of a country embargoed by the United States, or are a foreign person or entity blocked or denied by the United States government. Unless otherwise explicitly stated, all materials found on the Website are solely directed to individuals, companies, or other entities located in the United States. Assignment - This Agreement, and any rights and licenses granted hereunder, may not be transferred or assigned by you, but may be assigned by CorePharma without restriction. General Governing Law. You agree that: (i) the Website shall be deemed solely based in New Jersey; and (ii) the Website shall be deemed a passive one that does not give rise to personal jurisdiction over CorePharma, either specific or general, in jurisdictions other than New Jersey. This Agreement shall be governed by the internal substantive laws of the State of New Jersey, without respect to its conflict of laws principles. The application of the United Nations Convention on Contracts for the International Sale of Goods is expressly excluded. Any claim or dispute between you and CorePharma that arises in whole or in part from the Website shall be decided exclusively by a court of competent jurisdiction located in Middlesex County, New Jersey, unless submitted to arbitration as set forth in the following paragraph. Arbitration. For any claim (excluding claims for injunctive or other equitable relief) under this Agreement where the total amount of the award sought is less than $10,000, the party requesting relief may elect to resolve the dispute through binding nonappearance-based arbitration. The party electing such arbitration shall initiate the arbitration through an established alternative dispute resolution ("ADR") provider mutually agreed upon by the parties. The ADR provider and the parties must comply with the following rules: a) the arbitration shall be conducted by telephone, online and/or be solely based on written submissions, as selected by the party initiating the arbitration; b) the arbitration shall not involve any personal appearance by the parties or witnesses unless otherwise mutually agreed by the parties; and c) any judgment on the award rendered by the arbitrator may be entered in any court of competent jurisdiction. Notification Procedures: CorePharma may provide notifications, whether such notifications are required by law or are for marketing or other business-related purposes, to you via email notice, written or hard copy notice, or through conspicuous posting of such notice on our Website, as determined by CorePharma in our sole discretion. CorePharma reserves the right to determine the form and means of providing notifications. Entire Agreement/Severability. This Agreement, together with any amendments and any documents referenced herein, shall constitute the entire agreement between you and CorePharma concerning the Website. If any provision of this Agreement is deemed invalid by a court of competent jurisdiction, the invalidity of such provision shall not affect the validity of the remaining provisions of this Agreement, which shall remain in full force and effect. No Waiver. No waiver of any term of this Agreement shall be deemed a further or continuing waiver of such term or any other term, and the failure of CorePharma to assert any right or provision under this Agreement shall not constitute a waiver of such right or provision. Please contact us with any questions regarding this Agreement at info@corepharma.com. Dr. Dhaduk is the President and Chairman of the Board of Directors of CorePharma. He is an accomplished serial entrepreneur and serves as Chairman of several biotechnology companies, many of which he cofounded, including, CorePharma, Apicore Pharma (acquired by Mylan), Synerex Pharmaceuticals (acquired by Mylan), Nuron Biotech and Somahlution. 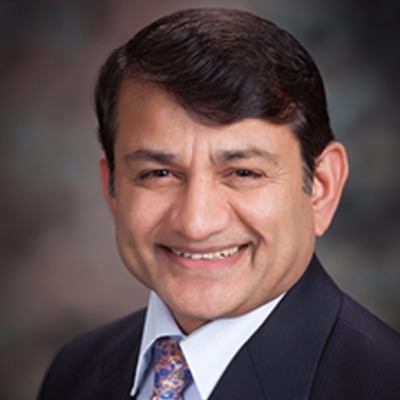 Dr. Dhaduk provides leadership and guidance in the areas of product development, marketing, partner relationships, financial matters, and corporate governance. 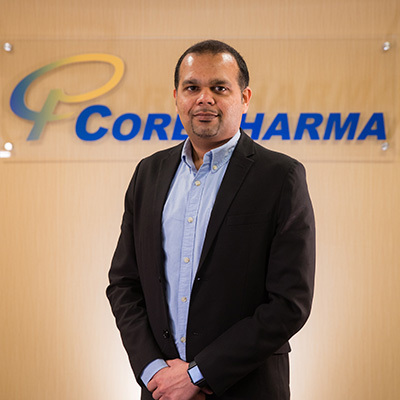 His extensive background in biotechnology and the pharmaceutical industry is an important asset to CorePharma's development and business plans. Dr. Dhaduk is an actively practicing neurologist and is currently the Chief of Neurology at the Community Medical Center in Scranton, PA and a Fellow of the American Academy of Neurology. His post-graduate medical training was conducted at the B.J. Medical College in Ahmedabad, India and at the Medical College of Pennsylvania in Philadelphia, where he also served as the Chief Resident in Neurology. Dr. Dhaduk has received numerous honors in medical practice. Most notably, he received the David Dunn Memorial Award in 1986 and 1987 for Outstanding Teaching and Study of Neurology at the Medical College of Pennsylvania. He also serves on the board of several professional organizations in neurology and medicine. He is the chair of CARITAS International Trading and CARITAS Hospitality, LLC, on the advisory boards of Hope Medical Institute, Lublin College of Medicine, Poland, as well as the Lupus Foundation of Pennsylvania. He has been awarded the National Leadership Award serving as honorary co-chairman of the Physician's Advisory Board, Pennsylvania. Arpit is an ambitious, driven entrepreneur who built his career primarily in Quality Control, Quality Assurance and Regulatory Compliance. Arpit has over 12 years of progressive experience working at several reputable pharmaceutical companies such as CorePharma, Ohm Labs (a subsidiary of Sun Pharma), US Pharma Labs, West-Ward Pharmaceuticals and most recently as the Head of Quality Assurance and Compliance at Aurolife Pharma (a subsidiary Aurobindo Pharma USA). Arpit is responsible for the oversight of the day to day operations at the CorePharma facilities, including providing strategic leadership for Quality, Operations, Product Development, Facilities and Engineering, Finance, Human Resources and Business Development. 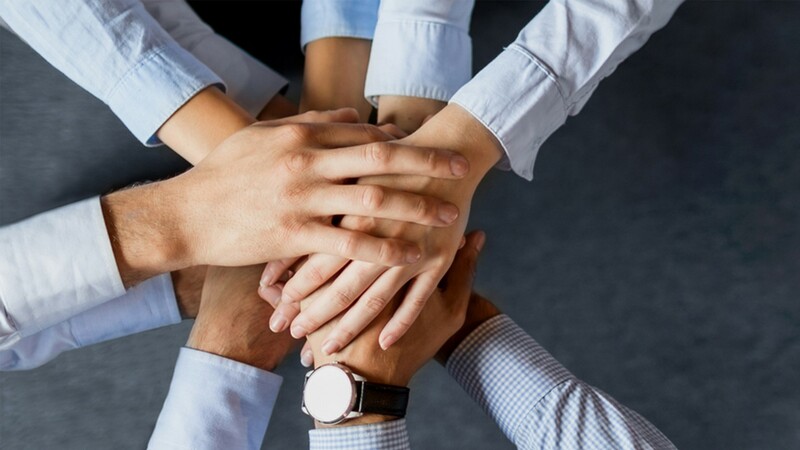 Having worked in Quality throughout his career, Arpit is focused on creating and building an organization with a culture of Quality and Compliance at its Core and ensuring the implementation of a sustainable business model that aligns with the CorePharma mission and long-term growth strategy. Arpit graduated from the L.M College of Pharmacy, Gujarat University with a Bachelor of Science in Pharmacy and the Fairleigh Dickinson University, NJ with an MBA in Pharmaceutical Management. Arpit is a Certified Quality Auditor with the American Society for Quality. Payal V Dhaduk is a young driven professional who has been actively developing knowledge and experience in the bio medical technology and pharmaceutical industry. Payal started her career in the bio-technology industry working as a project manager in which she assisted launching brands, developing sales leads, worked with manufacturers and also handling finances for DAP Dhaduk. 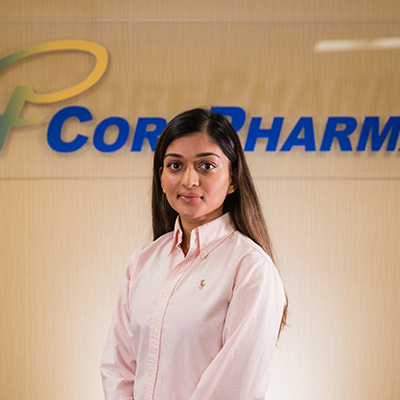 Payal joined CorePharma in 2018, as Head of Finance. Payal will play a leading role in managing and handling CorePharma's day to day Finances and Human Resources. Payal went to school for medicine with premed done at Medical University of Lublin in Europe and medicine done at SHSU in St. Lucia. Payal also has attended various conferences to help build and progress her business and finance development. She has participated in the Wharton Executive Education program along with UBS Young Professionals Program. Srinivasulu has over 22 years of industry experience in Quality Control, Analytical Research and Development, Quality Assurance and Regulatory Compliance. 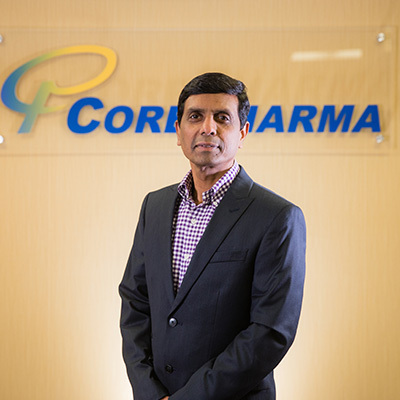 Prior to joining CorePharma, Srinivasulu held positions of increasing responsibility. Most recently he was the Director of Quality Control and ANDA Projects at Aurolife Pharma LLC (a subsidiary of Aurobindo Pharma USA), Ohm Laboratories Inc. (Subsidiary of Sun Pharma), Aurobindo Pharma Ltd. and Dr. Reddy's Laboratories. Throughout his career he has been involved in the development and filing of over 200 ANDA products and closely facilitated regulatory inspections such as cGMP, PAI, PAS and Customer audits. Srinivasulu Ale joined CorePharma in February, 2018 as the Director of Quality and Analytical Research & Development. He is responsible for the oversight of Quality Assurance, Quality Control and Analytical Research & Development functions and plays a key role in managing and developing quality systems. Srinivasulu will also be responsible for development and validation of analytical method and all site transfer projects. Srinivasulu graduated with a Bachelor of Science Degree in Chemistry from Osmania University, India and a Master's Degree in Chemistry from Sri Venkateswara University, India. Rajendra has over 23 years of industry experience in development, scale up and commercialization of various dosage forms throughout multiple organizations in roles of increasing responsibility. Prior to joining CorePharma, Rajendra was the Director of Product Development at G&W Laboratories. Previously Rajendra held managerial positions in Product Development, Technical Services and Regulatory Affairs at Aurolife (a subsidiary of Aurobindo Pharma USA), Ohm Laboratories (a subsidiary of SunPharma), Wockhardt and Dr. Reddy's. Throughout his career he has been a part of the development of over 200 ANDA's. 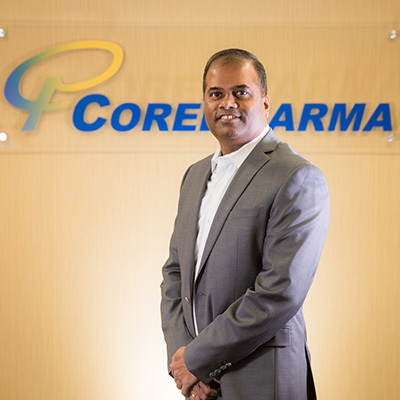 Rajendra Nagamalla joined CorePharma in March 2018 as Director of Product Development/Technical Services. Rajendra will lead both Product Development and Technical Services. He plays a key role in managing and developing our product portfolio from product selection to development, scale up and post approval technical support. He will also be responsible for all site transfer projects and technical due diligence for CorePharma clients. Rajendra has hands-on experience in Product Development of ANDA's including First to File and 505 (b)(2) products in various dosage forms such as Oral Solids, Liquids and Topical Semisolids. Rajendra will also focus on the development of specialty niche products. Rajendra graduated with a Bachelor of Science Degree in Pharmacy from Kakatiya University, India and a Master's Degree in Pharmaceutics from Jadavpur University, India. Chintan Joshi has over 13 years of experience in Quality Manufacturing, Technical Services, Validation Engineering and Operations Management. 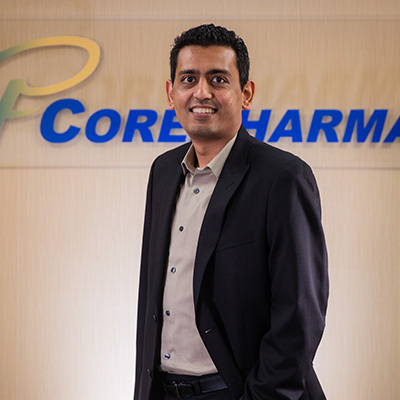 Prior to joining CorePharma, he gained his working knowledge and industry experience while employed at Amneal Pharmaceuticals, Aurolife Pharma (a subsidiary of Aurobindo Pharma USA) and Ohm Laboratories (a subsidiary of Sun Pharma). Chintan joined CorePharma in February 2018 and is responsible for the oversight of cGMP Manufacturing, Packaging and Warehouse Operations. Chintan brings with him a proven track record of Process Management and Operational Excellence. Chintan Graduated with a Bachelor of Science Degree in Pharmaceutical Science from Pune University, India and a Bachelor of Science Degree in Pharmacy from Nirma University, India. He also completed Project Management from Rutgers University NJ. Bhavesh has over 10 years of experience of working within a fast-paced pharmaceutical manufacturing environment. Bhavesh has experience managing complex projects such as GMP facility construction, validation, maintenance and engineering. He has a successful track record at companies such as CorePharma where he started his career and most recently at Heritage Pharmaceuticals where he was responsible for the overall facilities and engineering functions including the construction and commissioning of a 40,000 sqft state of the art manufacturing facility. 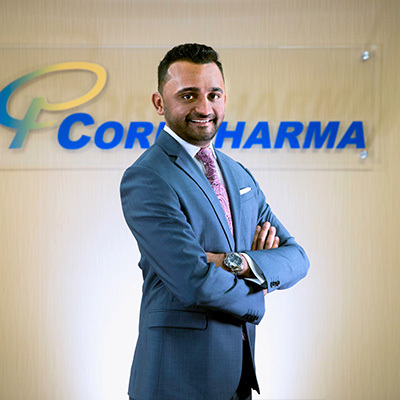 Bhavesh joined CorePharma in February 2018 as Director of Facilities and Engineering. He is responsible for the oversight of Facility, Engineering, EH&S, Security and Projects across both Manufacturing and Packaging facilities. Bhavesh graduated with a Bachelor of Science Degree in Mechanical Engineering from Sardar Patel University, India.